Dr. Young practiced intensive care unit (ICU) medicine before shifting into geriatrics and palliative care (PC). 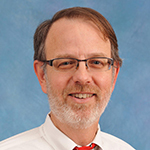 Previously, he was the Director of PC at New Hanover Regional Medical Center and later served as medical director of the UNC Geriatrics Specialty Clinic. Dr. Young was the lead author of a 2007 study which examined the effect of early PC consultation upon the length of stay of patients in an ICU and these findings were presented as a poster at an annual Society of Critical Care Medicine symposium. In 2017, he co-authored a study describing the impact of nurse navigator-directed PC upon the quality of life and hospitalization of chronically ill patients living at home. These findings were presented at both the annual Center To Advance Palliative Care (CAPC) and American Academy of Hospice and Palliative Medicine (AAHPM) conferences. At Transitions LifeCare, Dr. Young serves as medical director for both community-based PC and the Medicare program, Transitions CareChoices. He is also responsible for supervising the UNC PC fellows as they care for patients in long-term care facilities. S. Young, et al., “Impact of early palliative care consultation upon intensive care unit and hospital length of stay in patients with respiratory failure,” Critical Care Medicine, 2006, 34(12) Abstract supplement A146. Rowe S. Quintana C. Young S. Patel L: Impact of In-home Palliative Care on Advanced Heart Failure. Poster presentation at AAHPM Annual Assembly, 2018. Rowe S. Quintana C. Young S. Patel L: Impact of In-home Palliative Care on Advanced Heart Failure. Poster presentation at CAPC National Seminar, 2017.